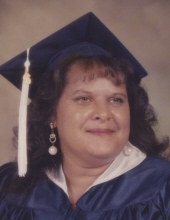 Linda Collins of Shannon was born Sunday, January 14, 1962 in Robeson County to the late James Monroe Collins and Betty Pearl Revels Collins and departed this life Tuesday, January 15, 2019 at Southeastern Reginal Medical Center in Lumberton NC, completing her journey of 57 years. Linda enjoyed watching Hallmark Movies as well as keeping up with the goings on of the community by social Media. She is survived by three sons: William Collins of Red Springs, Derrick Collins and Shawn Collins both of Shannon; two brother: Terry Collins and wife June and James Wayne Collins both of Shannon; one sister: Betty A. Oxendine and husband Roy; three grandchildren: Francheska, Alexis and DeShawn as well eight nephews and nieces: Billyjo, Jessica, Allison, Terry Brandon, Christopher, Ashley, Shania and Austin. Visitation will be from 6:00 PM until 8:00 PM Friday, January 18, 2019 at Boles Funeral Home Chapel in Red Springs, followed by a funeral at 8:00 PM at the Funeral Home. Graveside will 1:00 PM Saturday, January 19, 2018 at the Betty and James Collins Cemetery. To send flowers or a remembrance gift to the family of Linda Collins, please visit our Tribute Store. 16412 NC HWY 71 N.
"Email Address" would like to share the life celebration of Linda Collins. Click on the "link" to go to share a favorite memory or leave a condolence message for the family.